I'm late again this month due to a bunch of lame occurrences this month (including being sick at the moment), but I'm so glad I ended up baking this recipe yesterday! The May 2010 Daring Bakers’ challenge was hosted by Cat of Little Miss Cupcake. Cat challenged everyone to make a piece montée, or croquembouche, based on recipes from Peter Kump’s Baking School in Manhattan and Nick Malgieri. 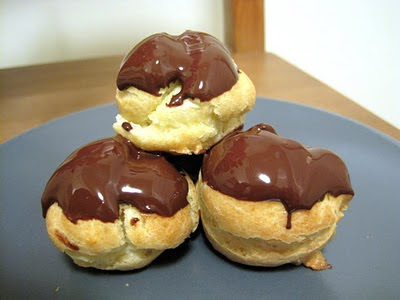 I did try the choux recipe from the challenge, but sadly ended up with scrambled eggs. I think I cooked the dough for too long and then added the eggs too soon! Anyway, we had exactly the number of eggs left to make one more half-batch, so I turned to my trusty Sherry Yard cookbook to rescue me, since I've never had a recipe of hers fail. I ended up with beautifully puffed choux, with a coconut pastry cream filling (just replace half the milk in any pastry cream recipe with coconut milk), dipped in dark chocolate. Heaven! And enough to sooth any problems you might be having. :) The recipes are available from Cat. 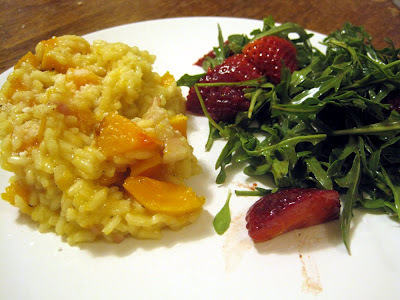 After making roasted butternut squash risotto, I couldn't resist trying another risotto recipe. This one used sun-dried and roasted-tomatoes as the main flavor, and they definitely didn't disappoint. I would rate this recipe as not quite as sublime as the butternut squash one, but still perfectly delicious. I like that it has a few different components that all come together. The risotto itself is full of flavor from sun-dried tomatoes. I added about half again as many as were called for in the original recipe, but I think even more wouldn't have been amiss (I've doubled the sun-dried tomatoes in the recipe printed below). Once it's finished, the risotto is topped with toasted pine nuts for a crunchy topping and roasted cherry tomatoes for a burst of flavor. 1. Preheat the oven to 400 F. Toss the cherry tomatoes with olive oil and season with salt and pepper. Spread on a foil-lined baking sheet and roast in oven about 10-15 minutes, until soft and slightly browned. Shake the tray occasionally during baking. 2. Melt the butter with the olive oil over medium heat. Add the shallots and garlic, and cook until they start to soften. Add the rice and cook, stirring, until edges of rice begin to grow translucent, about 2 minutes. 3. Add the white wine, and stir until absorbed by the rice. Stir in the sun-dried tomatoes. Gradually add the broth one cup at a time, stirring frequently, allowing each cup of broth to be absorbed by the rice before adding more. Rice is done when creamy and tender, but still a bit al dente. 4. 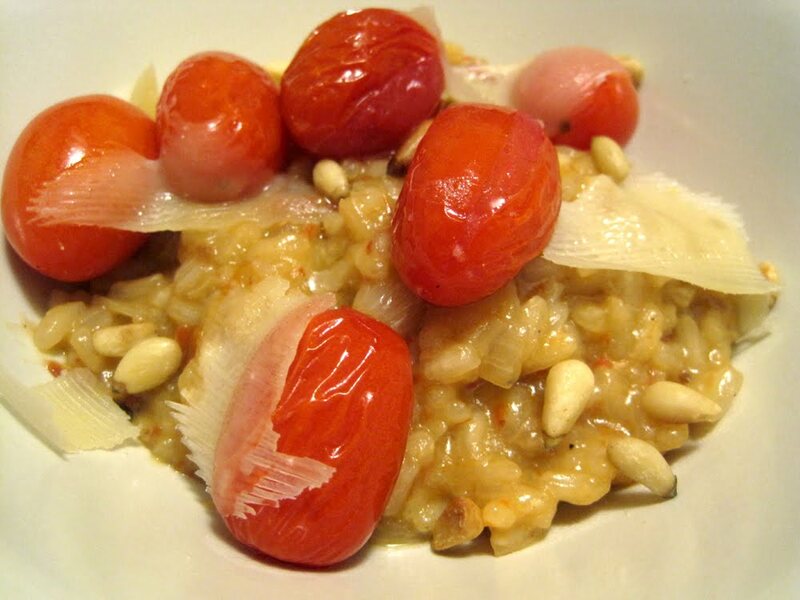 Serve the risotto topped with roasted tomatoes and sprinkle with toasted pine nuts. 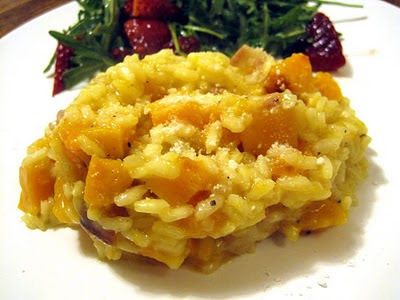 This butternut squash risotto is absolutely amazing! I've made risotto a couple of times in the past, but hadn't given it a try in a few years. I always think of it as a complicated dish, and while it does involve stirring for quite a while, it really comes together rather easily - much more so than I had remembered! I think the trick is to use a non-stick Dutch oven to cook the risotto and leave it on low heat, so that you can walk away and do prep for a side dish or do some dirty dishes occasionally without disaster. This particular risotto was not only easy; it was super delicious with lots of layers of flavor. Roasted butternut squash is always one of my favorites, with its caramelized, sweet taste. Combine that with salty pancetta and the je ne sais quoi of saffron and you've got what might just be the perfect risotto. Be warned, though, that this is very rich - you definitely want an acidic side to pair, like this red berry-arugula salad. 1. Preheat the oven to 400 degrees. Peel the butternut squash, remove the seeds, and cut it into 3/4-inch cubes. Place the squash on a sheet pan covered in foil or parchment and toss it with the olive oil, 1 teaspoon salt, and 1/2 teaspoon pepper. Roast for 25 to 30 minutes, tossing once, until very tender. Set aside. 2. Meanwhile, heat the chicken stock in a small covered saucepan. Leave it on low heat to simmer. In a heavy-bottomed pot or Dutch oven, melt the butter and saute the pancetta and shallots on medium-low heat for 10 minutes, until the shallots are translucent but not browned. Add the rice and stir to coat the grains with butter. Add the wine and cook for 2 minutes. Add 2 full ladles of stock to the rice plus the saffron, 1 teaspoon salt, and 1/2 teaspoon pepper. Stir, and simmer until the stock is absorbed, 5 to 10 minutes. 3. Continue to add the stock, 2 ladles at a time, stirring every few minutes. Each time, cook until the mixture seems a little dry, then add more stock. Continue until the rice is cooked through, but still al dente, about 30 minutes total. Add the roasted squash cubes and stir to heat through. Top with grated Parmesan and serve immediately - the risotto will get gummy if it sits around for too long! Yes, the BBA Challenge is still alive, just rather delayed! This has not been the best semester for my bread baking (and in fact I even let my sourdough die due to neglect! ), but now that the semester is wrapping up I am trying to bake more. I recently made two loaves, the rye bread (marbled rye in the book but I made mine all one color) and the multigrain bread. The rye bread was amazing - like that squishy rye you get in the store, except more delicious! That may not be everyone's cup of tea, but I am a huge fan of that sort of bread. I think the secret to success was Crisco. I always turn my nose up at Crisco and say "oh, butter tastes better", but the texture difference really is remarkable. And now that you can get the sort without trans fats, I don't think it's much more terrible for you than butter is. So - I am firmly on the Crisco bandwagon, and I definitely think it made this bread! The multigrain bread was more of a disappointment. Although it was very tasty, it just wasn't as "hearty" as I was expecting from a bread named "Multigrain Bread Extraordinaire." You couldn't really pick out the individual components very well, like I was expecting. Basically, I saw this as an inferior version of Anadama Bread. 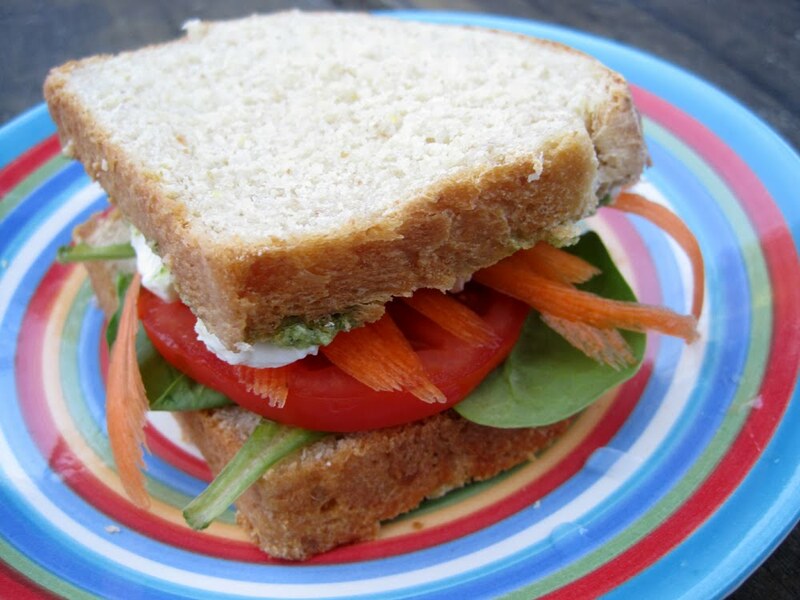 However - it still did make a pretty fantastic veggie sandwich with pesto, tomatoes, fresh mozzarella, spinach, and shaved carrots, as well as a mean pb&j. 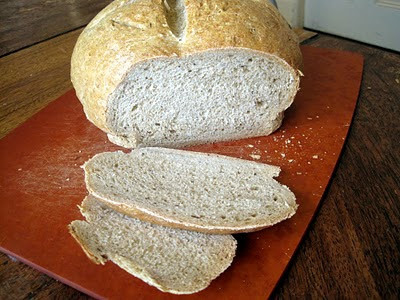 Overall, the rye bread I will definitely be making again, while the multigrain bread recipe will likely be shelved. I made these cupcakes for my friend Jessie's birthday. She requested pina colada cupcakes, and on that count these weren't entirely a success. I thought using a hummingbird cupcake recipe but subbing coconut for the pecans would work well - after all, the cupcakes are made with pineapple and banana! Unfortunately, the flavors just didn't come through as "pina colada" as much as I wanted. However, the cupcakes were super tasty and enjoyed by all (at a tiki bar! ), so these were at least a partial success! 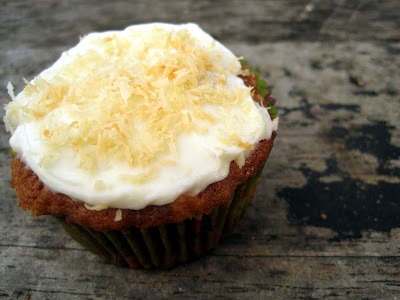 The toasted coconut on top added a festive touch making these perfect for a birthday. While they weren't quite pina colada, I would definitely recommend these cupcakes as a coconut-y twist on hummingbird cakes. 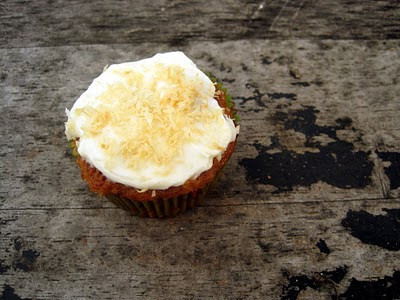 And next time I want pina colada, I think I'll try a coconut cupcake and top it with some sort of pineapple frosting. 2. Mix together the sweetened coconut, bananas, pineapple and 1/2 cup flour in a small bowl. 3. Whisk the remaining 2 1/4 cups flour, ginger, baking soda and salt in a bowl. Beat the eggs and granulated sugar in a separate bowl with a mixer on high speed until thick and light, 5 minutes. Gradually beat in the vegetable oil. 4. Sprinkle the flour mixture over the egg mixture, then gently fold to make a thick batter. Fold in the coconut-fruit mixture, then transfer the batter to the prepared pans. Bake until a tester comes out clean. 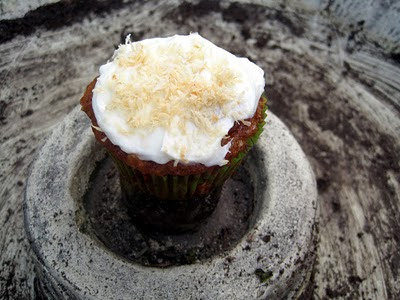 Cool the cupcakes, then frost, and sprinkle with toasted unsweetened coconut. One of my favorite blog events, You Want Pies with That?, has returned! (Actually, it returned last month, but I missed out because I was busy with school.) This month's theme is pizza pies. I definitely couldn't miss out on that one, because I love making pizza! This particular pizza is definitely one of my favorites. 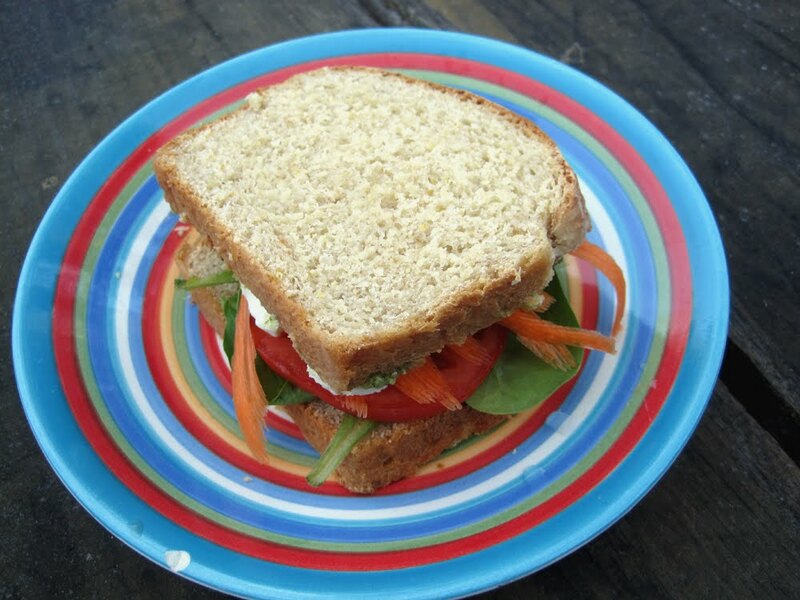 It's adapted from Cooking Light, but in the process has become not particularly "light" - but it's super delicious. Salty prosciutto, sweet pears, caramelized onions, and gruyere cheese combine to make an absolutely delicious pizza. 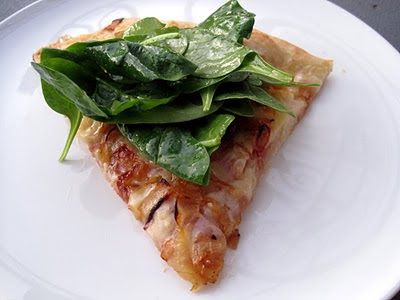 It's topped with lightly dressed baby spinach, which wilts just a little on the warm pizza and provides the perfect green crunch to the meal, balancing out all the richness in the other toppings. 2. Heat some olive oil in a large skillet. Add the onions and saute over medium-low heat until browned and caramelized, about 15 minutes. Season with salt and pepper. 3. Stretch half the pizza dough to fit your pan. Brush with a thin layer of olive oil. Sprinkle with cheese, pears, prosciutto, and caramelized onions. 4. Bake pizza until bubbling and browned, 10-15 minutes. 5. Meanwhile, whisk together olive oil, Cabernet vinegar, and a bit of mustard to make a dressing. Toss with the spinach. 6. Pile the spinach onto the hot pizza when it comes out of the oven. Cut into wedges and serve. I'm sending this recipe off to BSI: Prosciutto, hosted this week by Loser for Life. I'm a bit late with this month's Daring Bakers recipe, but better late than never, right? This dessert was definitely worth waiting for. The April 2010 Daring Bakers’ challenge was hosted by Esther of The Lilac Kitchen. She challenged everyone to make a traditional British pudding using, if possible, a very traditional British ingredient: suet. I didn't manage to find suet, but I did steam my first ever pudding! 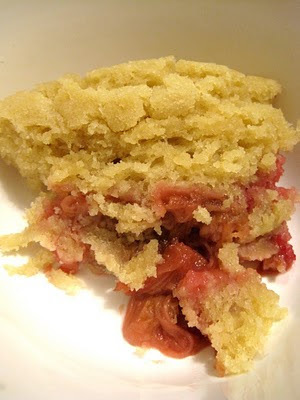 I decided on a rhubarb pudding since it's getting to be that season and rhubarb is one of my favorite ever ingredients. The recipe itself was very easy - soften rhubarb on the stove with sugar and ginger, and then top with a sweet cake batter. The steaming was new to me. I ended up using a ceramic dish I dug up from our pots and pans shelf, and set it in a big dutch oven with a canning rack in the bottom. This worked beautifully, even when the rubber band subbing in for string broke from the heat! (I guess in retrospect that was not such a great idea!) Even so, the parchment didn't seem to leak and the pudding was perfectly fluffy and delicious - not at all soggy as I was a little worried it would be. The tart rhubarb made a nice contrast with the sweet cake, and overall this was a super tasty dessert that I'll definitely make again in some form or another. It's certainly not the most beautiful dessert ever, but it makes up for that in tastiness! Note: In true British style for this challenge, I used a British recipe with weights rather than volume measures. Time to pull out that scale! Sorry - I don't have conversions. 1. Combine the rhubarb with 75 g of the sugar and the ginger in a pan over a gentle heat for several minutes until softened, stirring occasionally. Remove from heat. 2. Grease a 900 ml pudding basin. 3. Put butter, shortening, and remaining sugar in a bowl and cream together. Stir in vanilla extract, then beat in eggs, a little at a time. Stir the flour into the mixture. 4. Spray your pudding basin with oil. Spoon rhubarb into the bottom of the basin, then spoon the sponge mixture on top and level off surface. 5. Cover the pudding basin with a layer of parchment and then a layer of foil. Secure with a string. Steam over simmering water for about 1-1/2 hours, covered, checking regularly that the pan does not boil dry. Let cool about 10 minutes, and then spoon out into bowls and enjoy!